Those that follow me on Twitter or even my photo blog may have noticed my tweets or photo of my experience with Alice. 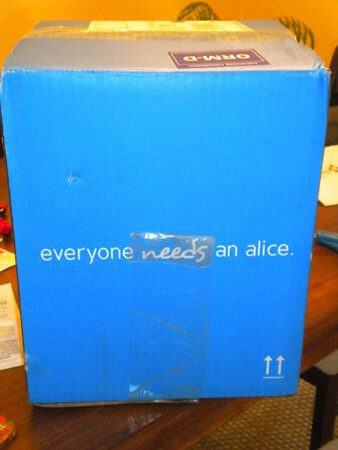 Alice is a website you can order household/cleaning/pet supplies – and oh so much more. You can find your favorite products, or try new products, and even save your products to a “shelf” so you can find them easily in the future. The site allows you to set reminders for purchases, so say if you buy toilet paper or paper towels every 4 weeks, you will receive a reminder to make that purchase before you run out! The downside of Alice is that you have to buy six items – but there is no minimum cost you have to meet. For instance, in my last order, I purchased Ziploc bags (the kind made with recycled materials! ), dryer balls, sunscreen, dishwashing soap (by Seventh Generation), shaving gel and plastic wrap. My total for all the items was $26. I placed the order on Thursday and had it on Monday. I encourage everyone to try the site out at least once. The links in this post are my referral link (another cool thing about Alice! If you get friends to sign up, you get discounts!) I received no compensation for this post – just a really cool service that I think all my friends and family need to know about! Try it out….and then let me know how you liked it!